Summary: The rebellion of Tuaregs and other ethnic groups in northern Mali has continued gaining territory, and now threatens major cities in the north, where the rebels seek to establish an independent country called Azawad. Meanwhile, Malian military leaders upset with their government's handling of the rebellion have taken over the country in a coup, leading to increased chaos on the country's suspension from the African Union. After a month with no territorial gains or losses reported, on March 11 the National Movement for the Liberation of Azawad (MNLA) captured of the town of Tessalit in Mali's far north. Home to a major military base and an airport, Tessalit was a major prize for the rebels, most of whom come from the traditionally nomadic Tuareg ethnic group. Their push for independence continued two days later with the storming of Diré and Goundam, two towns near the major northern city of Timbuktu, though it is unclear whether those two towns are still occupied by the MNLA. this Wikimedia map (public domain). An unexpected turn of events came on March 21, when the Malian government fell in a military coup. The leaders of the takeover cited President Amadou Toumani Toure's ineffectiveness at combating the Tuareg revolt in the north as their reason; ironically however, the chaos caused by the coup has proved beneficial to the rebels, who on March 23 captured the town of Anefis on the road between Gao and Kidal, two of the north's major cities. The MNLA has boasted that it will soon take those two cities, as well as Timbuktu, and recently it has indeed been reported that Malian troops in Kidal are negotiating a surrender after the city was surrounded by Tuareg militias. 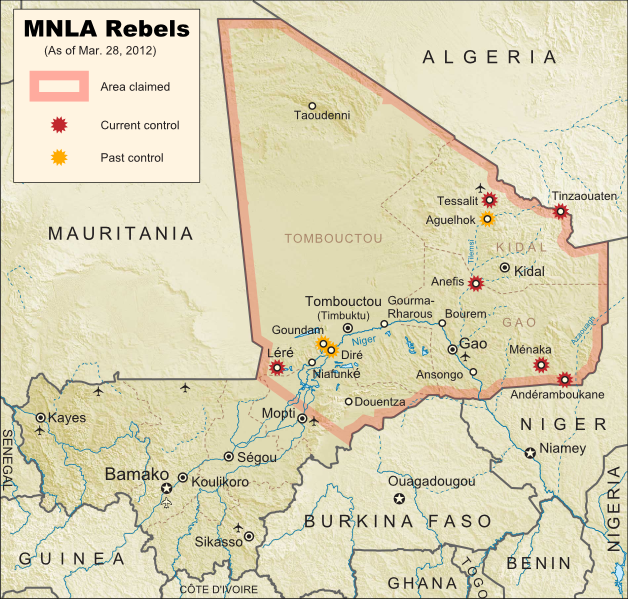 In the confusion, another Tuareg-led rebel group, the Islamist Ancar Dine, has also claimed to control the towns of Tinzaouaten, Tessalit, and Aguelhok, which according to most other sources are actually held by the MNLA. Though the two rebel groups have a share a history of being formed by leaders of former Tuareg rebellions, some local experts doubt that they are actually working together. 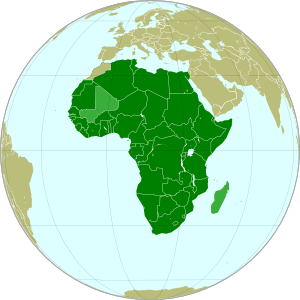 Meanwhile, the coup in Mali's capital city of Bamako has resulted in the country's suspension from the African Union (AU), an important regional organization which includes every country in Africa except for Morocco. Mali is one of only two currently suspended AU states, the other being Magascar, which also experienced a coup d'etat several years ago.